IRVINE, CA--(Marketwire - Sep 13, 2012) - The Joy Factory, Inc. announced today that it will launch a series of protective cases and accessories this month to complement the introduction of the Apple® iPhone®5. Eleven new case collections will soon enter the marketplace designed not only for the new thinner format, but also to support the way smartphone owners will use the device in their daily work and personal lives. "The Joy Factory's new suite of iPhone 5 cases is a natural extension of our high-quality, digitally-driven lifestyle accessories," said Sampson Yang, president of The Joy Factory and consumer electronics veteran. "These new cases will not only protect phones but will also communicate each user's personal style." Jamboree™ - The classic clear back case with a textured bumper maintains the original iPhone look and provides users with an extra comfortable grip surface. Its three bottom cut-outs protect the places around the Lightning charge port and speakers. Jamboree is available in gray, pink and black (MSRP $29.95). Alton™ - Similar to The Joy Factory's popular SmartFit case, this polycarbonate, lightweight cover highlights the sleek iPhone 5 design, and with its full coverage around the edges, protects the screen when face-down. Alton is available in smoke and clear (MSRP $24.95). Cameron™ - The durable, soft case is easy to grip and provides protection to the back and side phone surfaces. Cameron provides an option for those who seek to safeguard their phone without adding a lot of bulk to their device. Cameron is available in frosted smoke and frosted clear (MSRP $24.95). These products are currently available for pre-order at www.thejoyfactory.com and most cases come with a reusable water-resistant BubbleShield sleeve and a Prism Screen protector for the iPhone 5. Shipments are slated to begin through major retailers and selected retail stores in late September 2012. The Joy Factory, headquartered in Irvine, Calif., offers innovatively designed digital device accessories. The company's namesake is derived from the definition of Joy: the emotion of great delight or happiness caused by something exceptionally good or satisfying. This is the driving philosophy behind the company's commitment to creating an elite class of digital companion products that bridge today's complex technology and elicit a joyful experience for the consumer. The company's flagship product suite of iPad™ and iPhone® patented and patent-pending specialty accessories include versatile cases/stands, mounting systems and charging solutions to allow consumers to stay active and engaged with their smart devices in their daily lives. The company was founded by a team of gadget fanatics and designers with more than 40 years of expertise in the consumer electronics sector and was recently named an International CES Innovations '2012 Design and Engineering Awards Honoree' and as one of the 'Top 5 Mobile Case Brands' in About.com Reader's Choice Awards. Additional information is available at www.thejoyfactory.com, www.facebook.com/thejoyfactory or www.twitter.com/thejoyfactory. 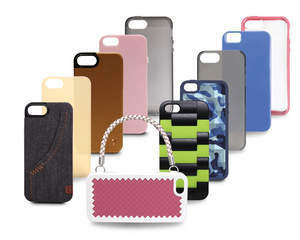 The Joy Factory's eleven new iPhone 5 case collections are designed not only for the new thinner format, but also support the way smartphone owners will use the device in their daily work and personal lives.